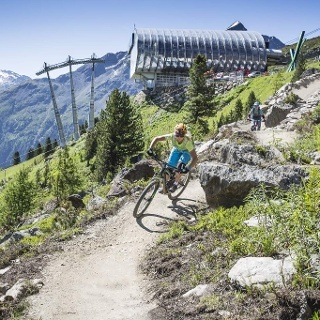 A magnificent Enduro Route leading right to the most remote spots of the BIKE REPUBLIC SÖLDEN. The trail is about 13 km long, featuring 600 meters of altitude gain. Technically difficult downhill stretches add to a fun-filled biking day. 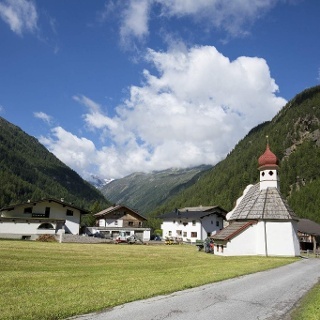 Starting at Freizeit Arena you take the asphalt road towards the lower valley until you reach the hamlet of Kaisers. here you keep to the left (uphill) towards the federal road. Attention - there is a short unlit tunnel! After a few hundred meters on the main road you turn left to Granstein. 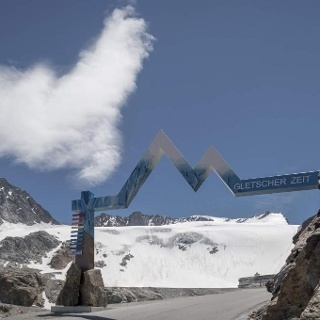 The climbing asphalt road joins a gravel trail leading past Leiterbergalm hut and one of of the access spots of Leiterberg Trail (672). 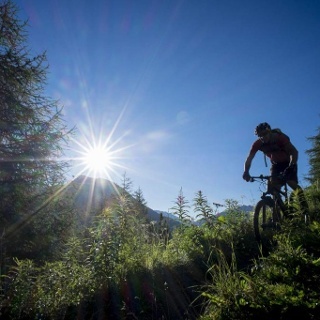 Although your muscles already feel weak, all efforts are rewarded with superb downhill biking on Leiterberg Trail. 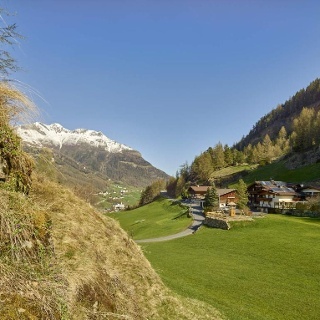 Don't miss the breathtaking panoramic view of Sölden's most popular mountains - Brunnenkogl and Söldenkogl - before you return to the valley floor. The best way to do so is enjoying a hearty snack at Leiterberg Alm. Not Tired any more? The challenging Nature Trail with very flowing sections is already waiting for technically skilled bikers. Leading through dense forest stretches, this route is not suitable for absolute beginners. 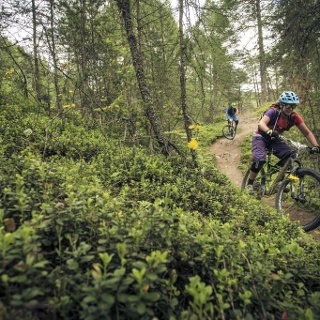 But more experienced bikers will love this trail from start to finish. 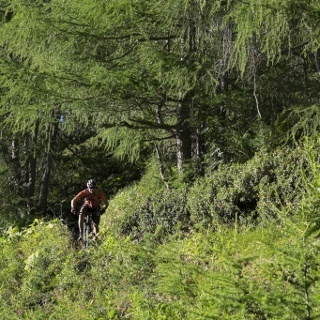 Its final part is very demanding and requires excellent biking techniques on truly varied terrain. The route ends in the hamlet of Leite where you take the 1.5 km long Lettn Line (6009) down to the Giggijoch base station. "Lettn Line", a very flowing and fun-filled trail, derives from its wet and muddy terrain. From the Giggijoch Mountain Gondola you follow the main road back to Freizeit Arena. Especially for biology experts: the area is rich in "usnea filipendula" - also known as tree moss or beard lichen that requires excellent air quality. Admire the marvelous threads high up in the trees. So dismount your bike for a moment and breathe crisp and clean air. Leiterberg Trail (672) crisscrosses the forest path no less than six times. It is a Shared Trail and highly frequented by walkers and hikers.